A war of words has erupted between Sinn Féin and Saoradh over the cancellation of a youth engagement event in Derry yesterday following pressure from the anti-Good Friday Agreement political group. 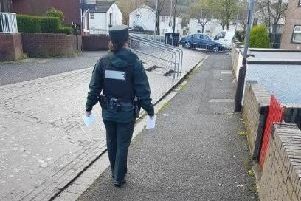 Sinn Féin Foyle MLA Karen Mullan said it was entirely unacceptable that the Long Tower Youth Club had been put in a position where it had had to decide not to take part in the engagement event in the Guildhall with the PSNI, local councillors and ex-combatants. She said: “It is disgraceful that a youth organisation seeking to provide a positive platform to young people should be forced to cancel it due to the actions of Saoradh. “The fact that Saoradh refused to even engage with the youth club is typical of their failure to rationalise or defend their own actions. But Saoradh spokesman, Paddy Gallagher, responded: “We expressed a keen desire to meet with their representatives on the basis they cancelled the event first, otherwise our protest would go ahead as planned. "Saoradh still seek engagement to relay not just our concerns but the concerns of those who attend their club and that of their parents. "We understand the need and desire of young people within our communities to engage in peer related conferences, however parents and youths involved with Long Tower Youth Club expressed particular concern to Saoradh in regards to the presence of Crown Forces."